If you purchase this book, you’ll be putting money in the pocked of a ghoul who revels in the deaths of people he disagrees with politically. Of course, if this is your intention, you’re no better than he. A few days ago Matt tweeted something nasty about Andrew Breitbart after his death, so now Breitbart’s fans — who obviously haven’t read the book and don’t care about it — are surging into Amazon to take their revenge. Isn’t the internet wonderful? I haven’t read the book myself because I’m swamped with other stuff, so I can’t say anything in particular about it. 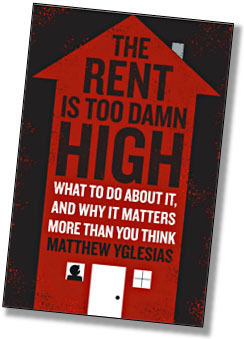 However, I’m familiar with Matt’s general argument that the high price of city living is an obvious sign that there’s high demand for housing in cities, which means that we ought to loosen up zoning and construction regulations and allow more housing to be built. Since cities are engines of economic growth, and bigger cities are even bigger engines, this would be good for everyone. If you want to read his full argument, which I imagine is pretty cogent, it will only set you back $3.99 thanks to the marvel of the Kindle eBook publishing model. But none of this matters at Amazon itself. Their review section is merely a place to piss on your political enemies. I suppose that’s nothing new, but this is certainly a starker example than usual. Caveat lector.